Here I am saving the best for last. Okay, second to the last, because the last post (I promise this will all end!) will be the expenses. The best part about being in a new place is trying out the food! Aside from the lazy and thrifty moments (yes, the street and convenience store food), my tummy had the pleasure of getting filled with the real thing. 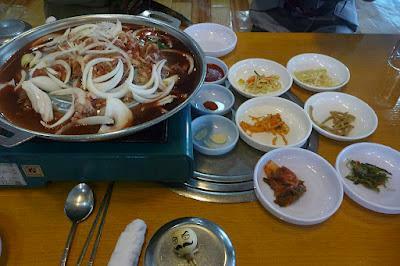 Bulgogi is a dish of strips of beef marinated in soy sauce, sugar, garlic, onions, and other stuff I am sure, and grilled on the table. 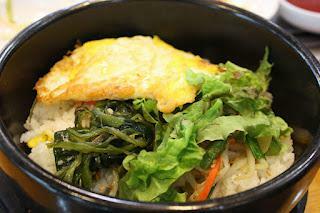 Bibimbap is a bowl of rice topped with vegetables. It may have beef and egg too. 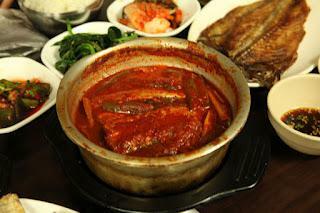 It is to be mixed together with gochujang (fermented chili paste). One of our dinners somewhere in Mapo-gu was sundae 순대 and bossam 보쌈. Sundae is not ice cream but steamed blood sausage. Eccch. It is made of pig intestine stuffed with blood, pork, garlic, and other non-pig stuff. 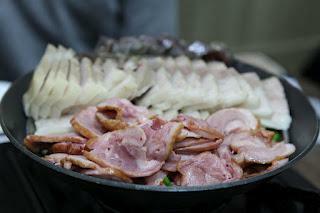 Bossam are pork slices served with leafy greens. It is eaten with lettuce or sesame leaf with ssamjang, topped with garlic (either raw or cooked), onion, kimchi or saeujeot (pickled fermented shrimp). Sundae, bossam, and leafy greens. The sundae is that dark brown stuff at the far end of the plate. Photos by Bee Chavez Lotsa banchan (side dishes). I'll get stuffed just eating these. At Insadong, we came across a restaurant called Sinpo Woori Mandoo, where we tried Sinpo bibimbap (rice with assorted vegetables and spicy dressing), umook woodong (soup with thick noodles and fish paste), and woori jjolmyun (similar to sinpo bibimbap, with noodles instead of rice and a boiled egg instead of sunny side up). And, not to forget, the banchan (right photo): kimchi, bean sprouts, pickled radish, and I don't know what the other one is. 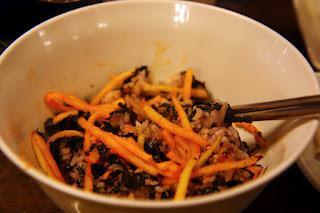 Sinpo bibimbap, umook woodong, and woori jjolmyun. 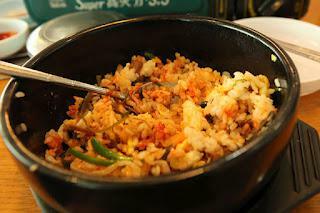 I was also introduced to galbijjim 갈비찜 and jeyuk bokkeum 제육볶음 by my friends. Galbijjim are beef ribs with radish, carrots, and other vegetables, cooked in soy sauce and other spices. 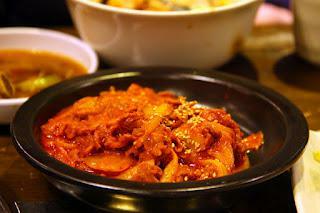 Jeyuk bokkeum is a spicy pork dish (quite obvious from its color). And then there's rice mixed with seaweed and vegetables (actually it was my friend who dumped the seaweed and veggies into my bowl), gyeran mali 게란말이 literally means rolled eggs, and soju 소주 which I am sure you know is rice liquor. 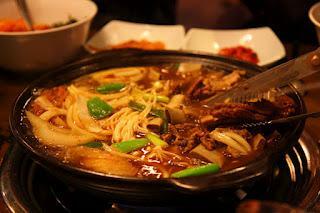 Another dish I never would have discovered if not for GaEun, MinJun, and SangCheol, is Andong jjimdak 안동찜닭. Originally from Andong, a city in Gyeongsangbuk province, this is a very spicy chicken dish with chili peppers (tons of it), potatoes, carrots, and clear noodles. We tried to tone down the spice level by picking away all the chili, but it was no use. They serve a bowl of cold radishy soup which is supposed to wash away the burning feeling in your mouth better than water. Yes, that cold radishy soup did help but I think I still drank 3 liters of water in this meal. 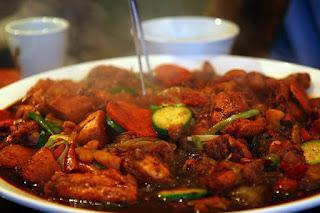 Oh yeah, once all the chicken disappears, burnt rice (dukot if you're Visayan) is mixed into the sauce. Yum. Not to forget that fishy lunch at Namdaemun Market: galchijorim 갈치조림 (boiled hairtail fish in soy sauce, chili, and garlic) and godeungeo 고등어 (fried mackerel). 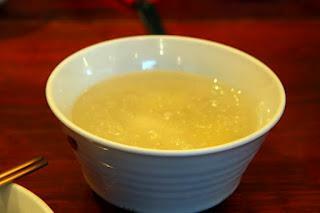 Loved galchijorim, specially its sauce. Nom nom nom. And our last lunch: strips of grilled pork belly called samgyeopsal 삼겹살. 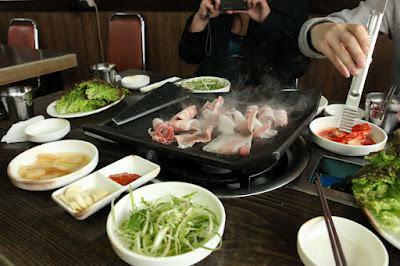 Samgyeopsal is eaten by placing a piece of grilled pork belly on a lettuce, topped with ssamjang, garlic (raw or cooked), and kimchi (fresh or cooked). Wrap the leaf up and pop the whole thing into your mouth. Yum!We have tried it in Cebu but wanted to try it in its home country. Thanks to MinJun for finding us a samgyeopsal place! 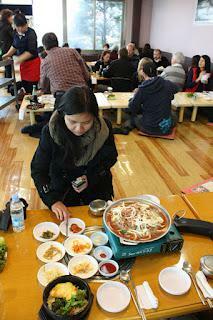 One serving cost 2500 won (about Php 100), and we had 6 servings for 4 people. And this, sadly, is the end of my adventure in Korean gastronomy. I loved all the food we had except for the sundae (blood sausage). Tip: Water is for free. If you drink water like a fish, I suggest you bring a water bottle with you wherever you go. You can have it refilled just about anywhere, in the airport, park, restaurants, hotels, etc.